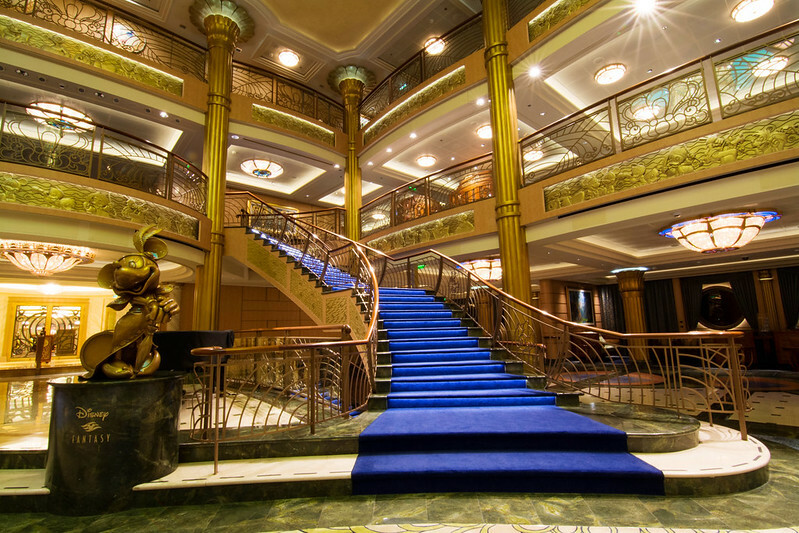 Starting on the Royal Princess over Christmas, I've made it a habit to bring my tripod and remote so that I can take long exposure photos in the late evening or early morning around the ship. 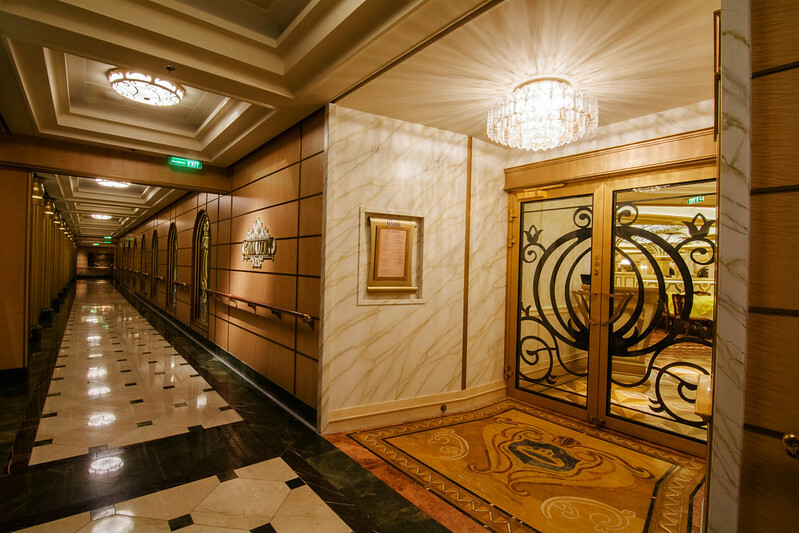 Between 11 PM and 6 AM, most guests are in their staterooms which allows for the opportunity to take photos of large public spaces without people. 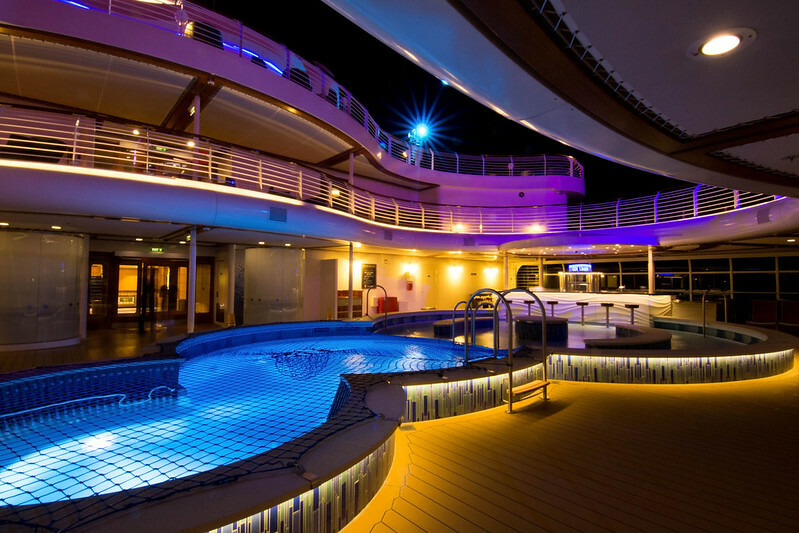 Not only that, but the lighting design on the latest cruise ships has become quite beautiful, and taking photos after dark allows you to really showcase the light both indoors and out on deck. 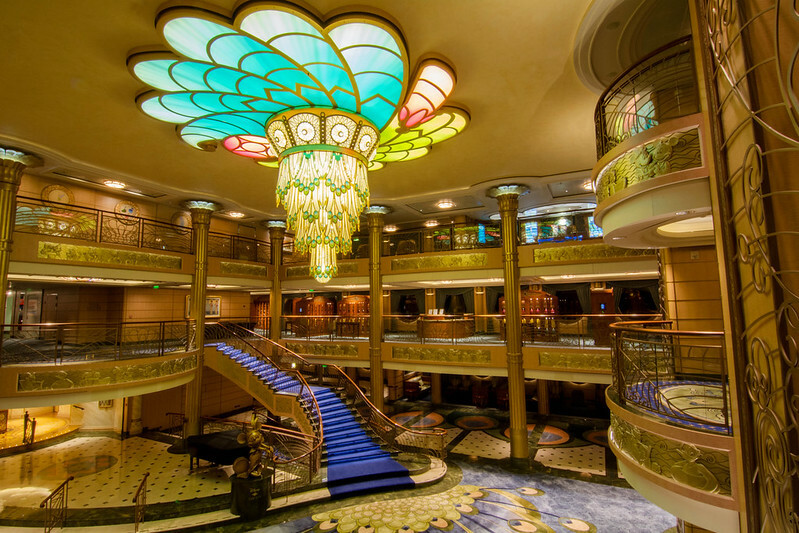 I was especially excited to photograph the Disney Fantasy because the ship is so beautiful. 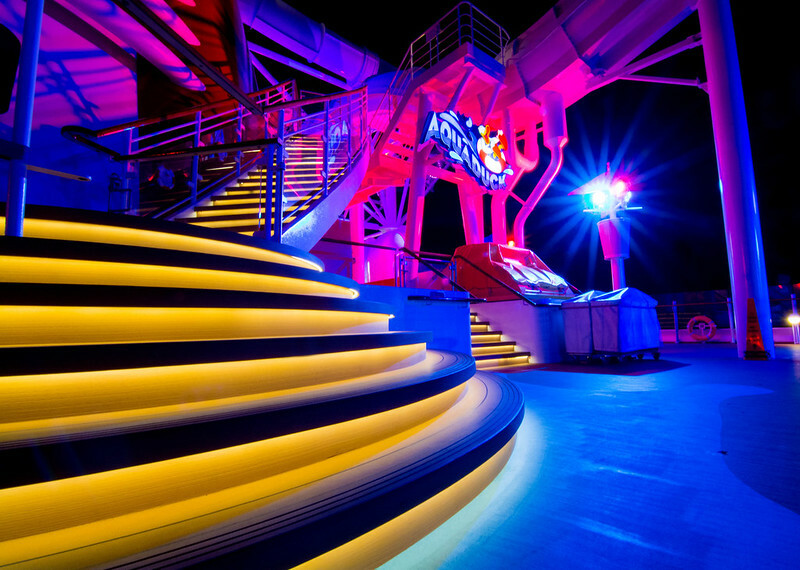 On the first night of the cruise, Max and I were walking back from the hot tub late at night, and he even admitted that he was excited to photograph the ship because the lighting on the Disney Fantasy is so incredible. 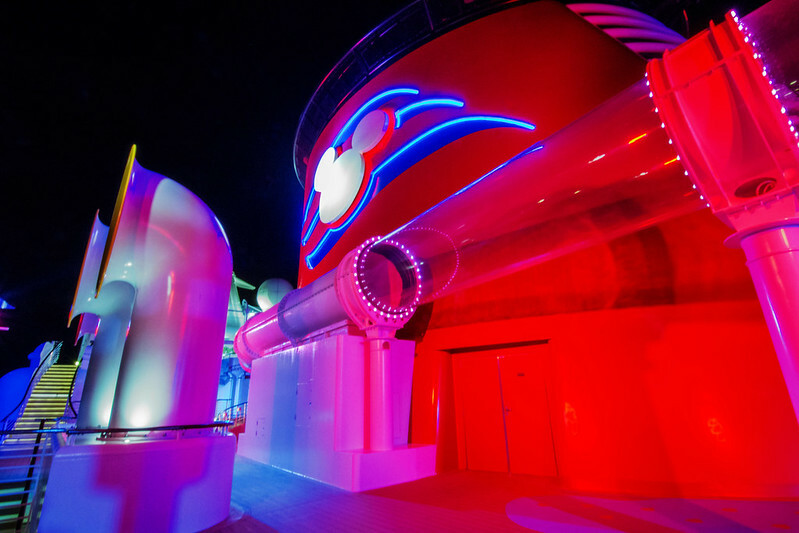 Well.... in all of the fun that I was having with my family, enjoying activities that the Disney Fantasy had to offer, I put my long exposures off until the last night. 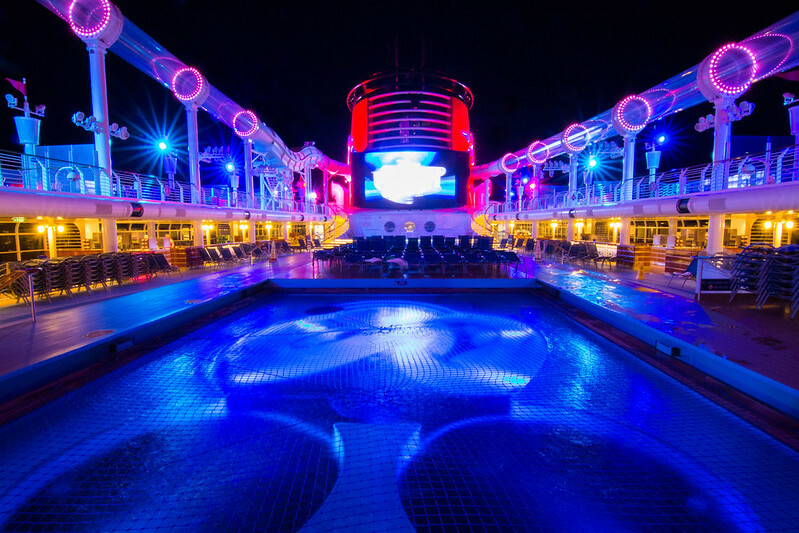 This was a mistake, and I will never be so careless again because on our way from Castaway Cay to Port Canaveral, we sailed high winds, rough waters, and periods of rain. I was really upset with myself and concerned that I wasn't going to be able to take the photos I wanted. 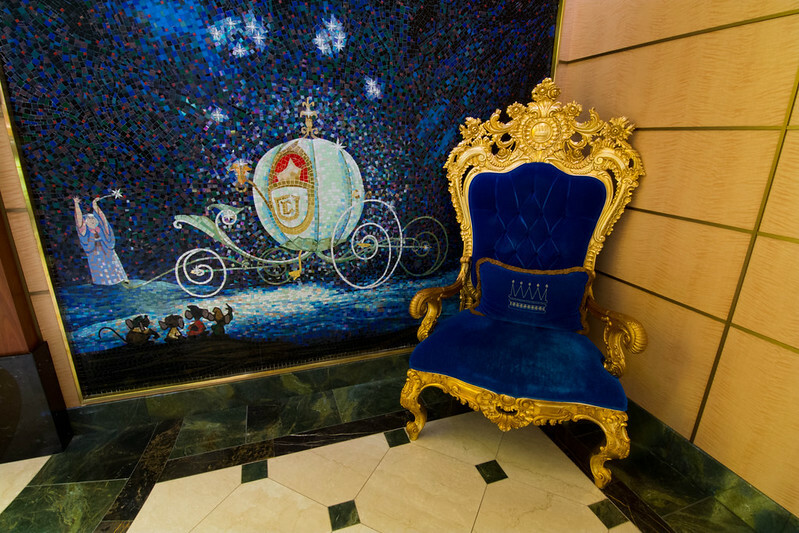 We started in Cabanas because I absolutely love this mosaic and wanted to make sure that I photographed it. Creating a 'correct' exposure is balancing the three elements of the exposure triangle - aperture, shutter speed, and ISO. The idea behind long exposures is that setting your camera on a tripod for stability allows you to lengthen the shutter speed so that can have a higher narrower aperture (meaning greater detail is rendered) and lower ISO (meaning less noise), and light is allowed into the camera over a longer period of time. 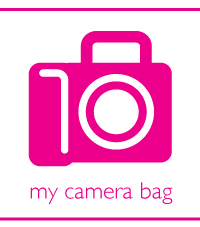 I am not an expert, I am simply a hobbyist photographer who enjoys improving my craft. I'm also not the best teacher, as I've taken Max with me several times to take long exposure photos, and I still can't seem to explain it to him so that it makes perfect sense. So if you are interested in photography and how to create manual exposures, I strongly recommend that you read Bryan Peterson's Understanding Exposure . It's the book that really taught me how to shoot in manual mode. All of my long exposures were taken with my Tokina f/2.8 11-16mm lens using my Mefoto Backpacker travel tripod and a wireless remote control to minimize camera shake for the sharpest possible photos. Max volunteered to go with me, and thank goodness for him! Like in Aruba on the Carnival Breeze, Max helped me block the wind from the camera and steady the tripod. He also really enjoys clicking the remote and helping me with the composition of the shots. I've learned that Max has an eye for detail, and he'll give me suggestions on how to compose each shot. Because the wind was so fast and strong, a really long shutter speed just didn't work, as the wind would shake the camera a bit over a period of 30-45 seconds. So I bumped up the ISO and was able to use a shutter speed of around 1-3 seconds while battling the wind. The shot pictured above was almost dangerous! The wind was really fast, so we were really cautious while on the top deck. We decided that trying to take photos on Goofy's Sport Deck would be unsuccessful and dangerous. 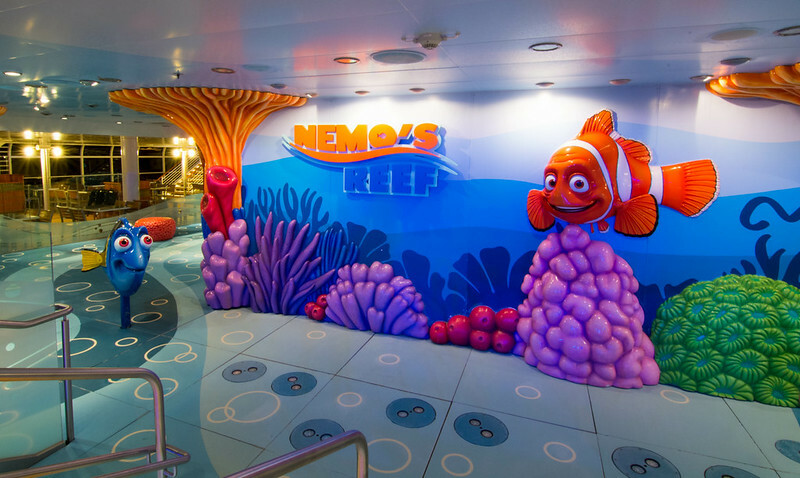 Nemo's Reef is the shaded splash area for small children. The photo of the Aqua Duck entrance might be my favorite shot, even with the carts and the cones in the background (which I would have attempted to move out of the frame if the wind wasn't enough of a battle). 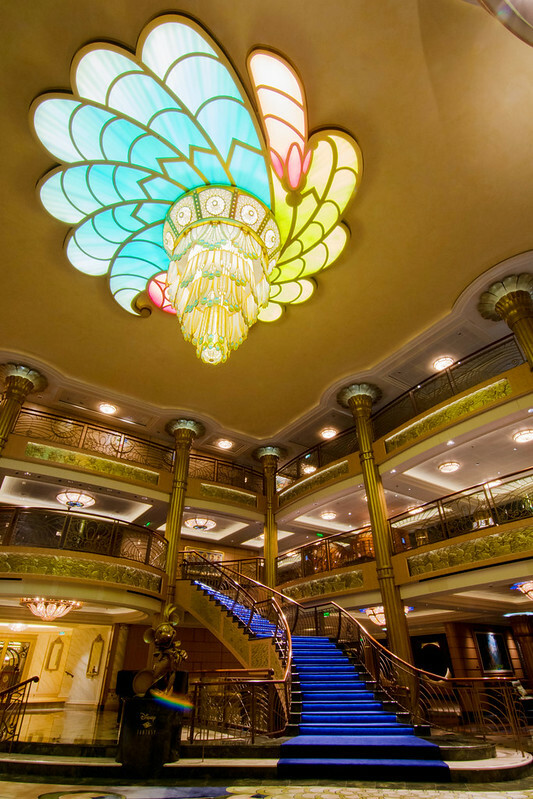 I really love the up-lit staircase. The Quiet Cove Pool was protected from the wind and a much easier location to shoot. They must put the net up early on the last night because normally the pool stayed open until midnight. 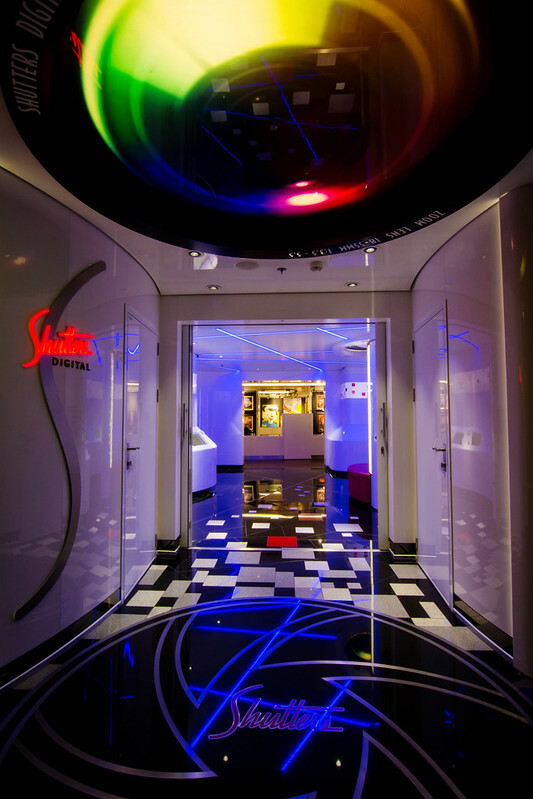 I really like how Disney Cruise Line designed "Shutters" their photo store. 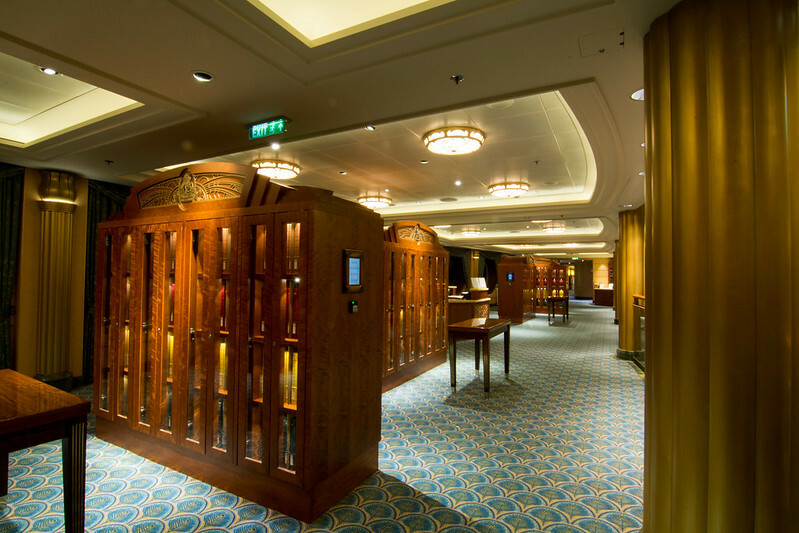 Each guest has a folio book which is stocked with hard copies of the photos they take on the ship throughout the cruise. 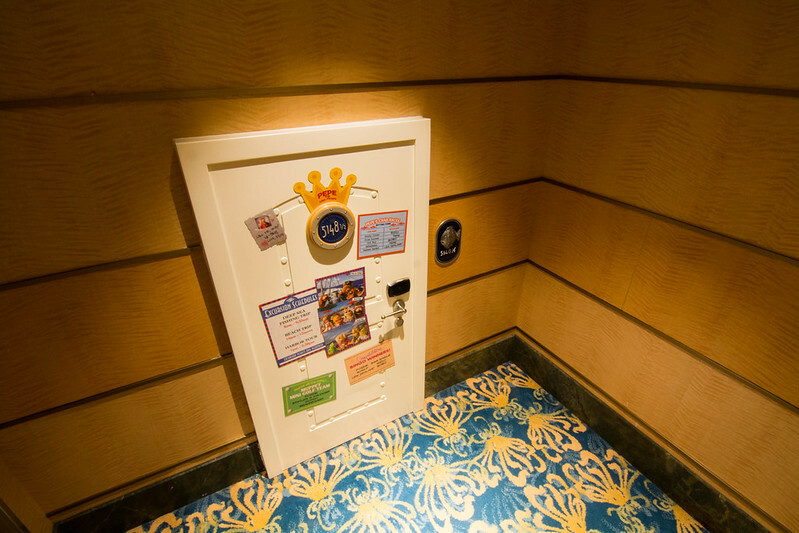 Disney uses face-matching software, as well as Key To The World cards (room keys) to assign the photos to the appropriate folders. The folders look like library books and are stored on shelves. This keeps the lobby area a bit controlled and organized. 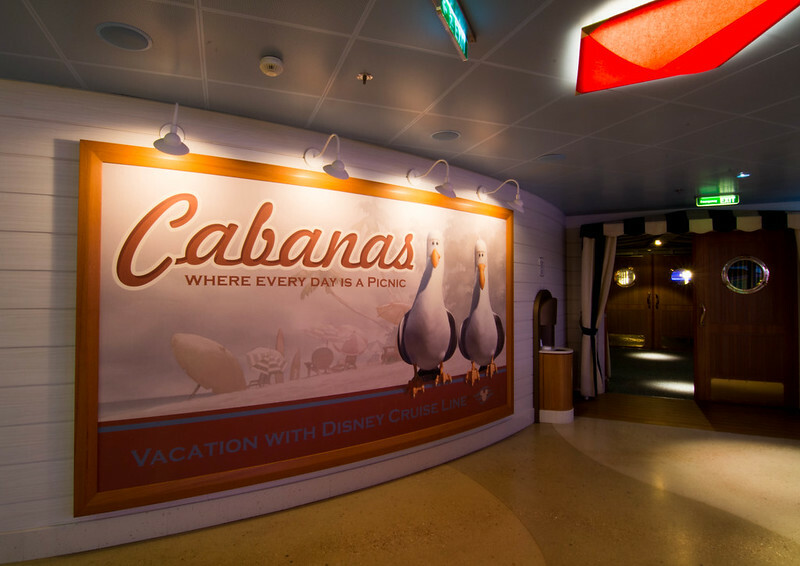 I also suppose that this works well for Disney because there is such a high demand for photos with the character photo ops around the ship, so they aren't really losing out on a marketing opportunity by displaying all guests photos for everyone to see. There is beautiful art in this gallery. I picked out a Captain Mickey original canvas that I really wanted. 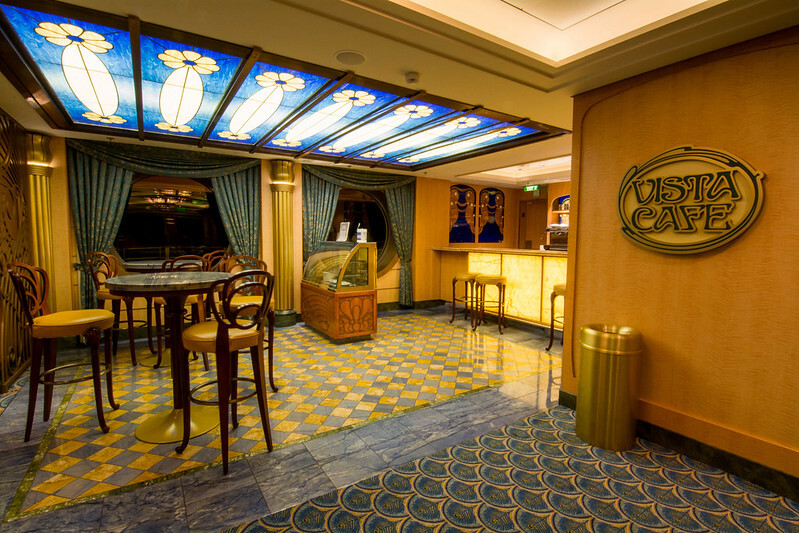 The Vista Cafe is where we met Jesse, our wonderful bartender at the Captain's Reception! 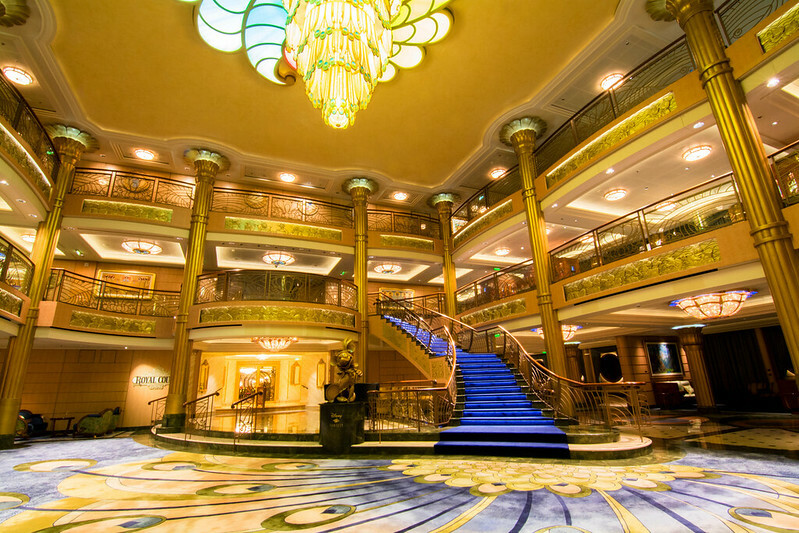 And the most grand lobby that I have ever seen on a cruise ship. 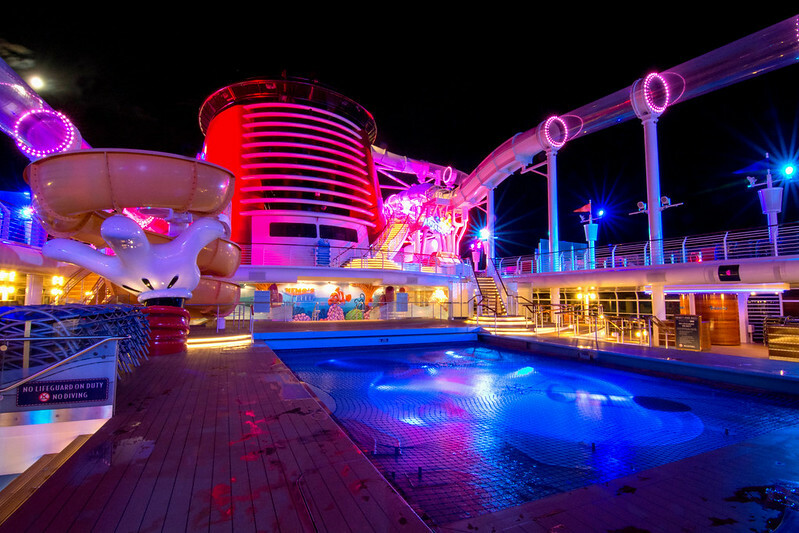 Disney Fantasy, you have stolen my heart. Preludes is the atrium connecting all of the shops. 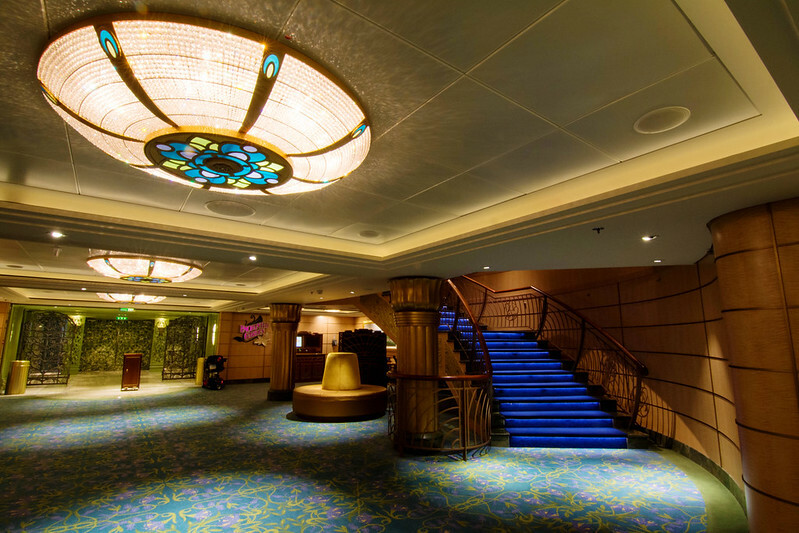 We were told on the second day when we took a ship tour that Preludes is actually the name of the snack bar outside of the Walt Disney Theatre (which was showing Million Dollar Arm, so I couldn't photograph), but whenever the Navigator says to meet at Preludes, it means here. 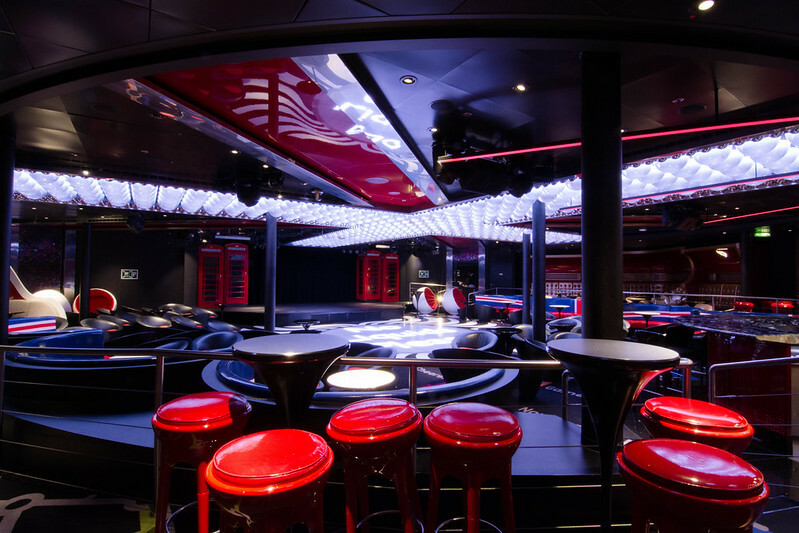 After 9:00 PM, Europa is the adults-only (18 and older) nightlife district on the ship. 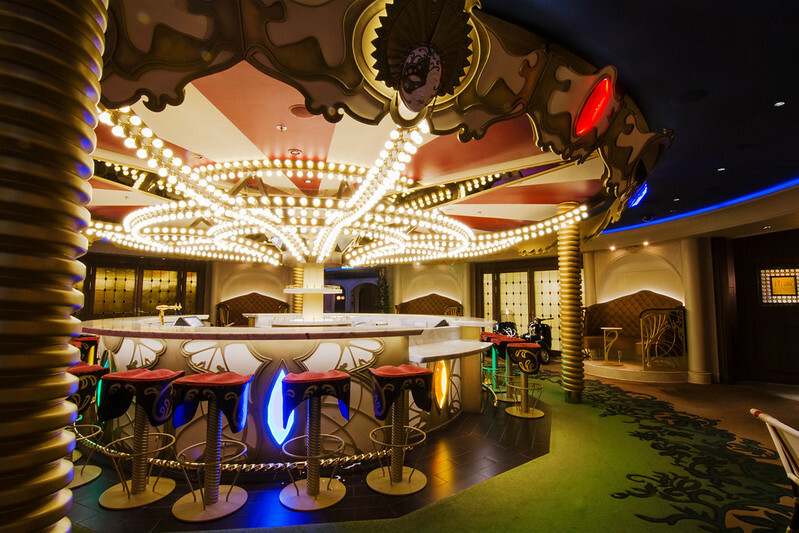 It consists of four distinctly themed lounges and a nightclub. 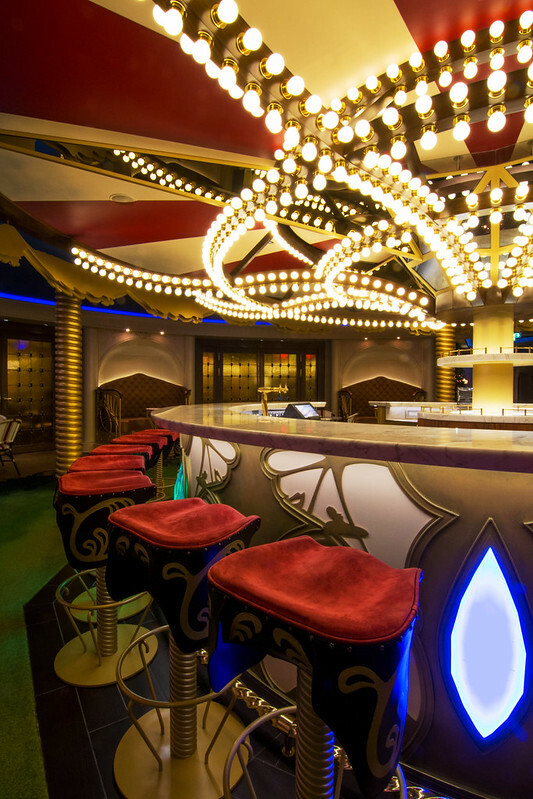 La Piazza is the Italian-themed lounge with classic Italian drinks like prosecco, wine, grappa, and limoncello. 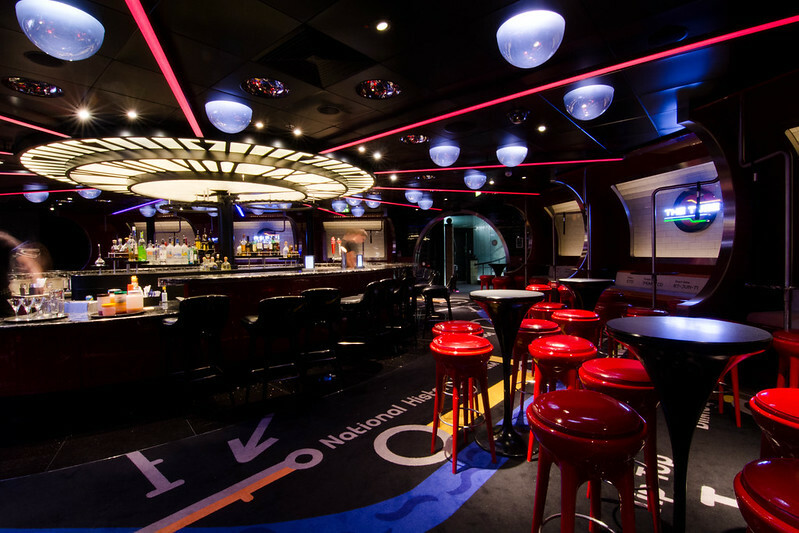 There is often live music, and the lounge has the capability to serve as overflow seating for The Tube, equipped with a drop-down projector screen. 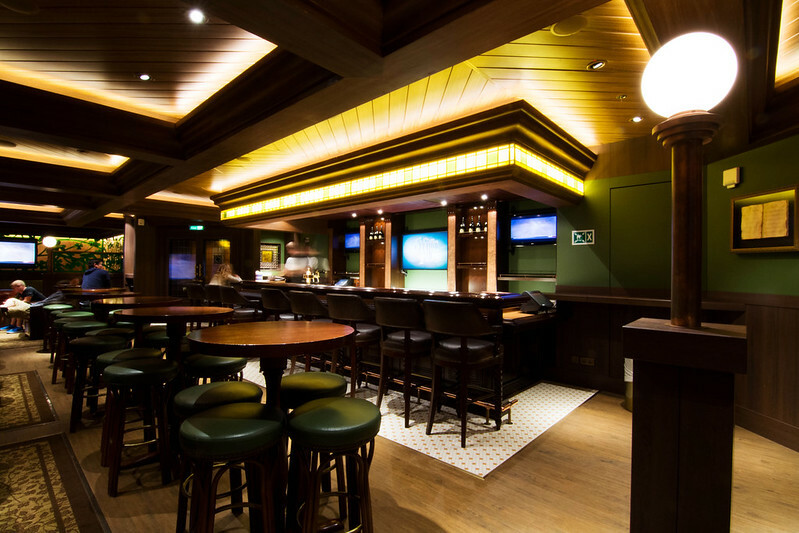 Also at La Piazza is a small bar with self-serve hors d'oeuvres. 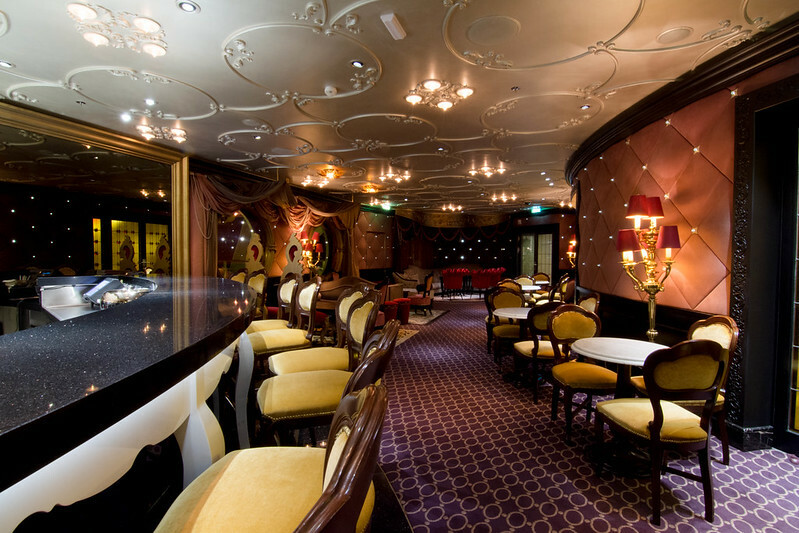 Ooh La La is the French champagne lounge offering exclusive champagnes, as well as delicious champagne cocktails. 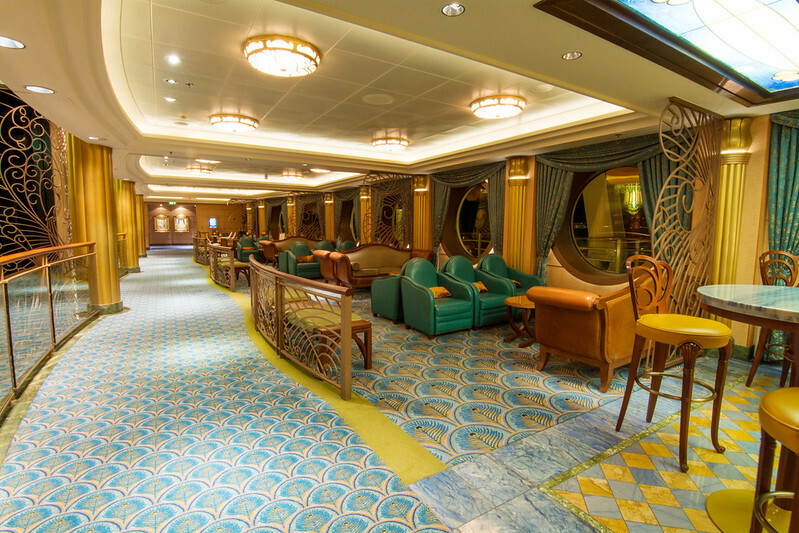 The lounge is restricted to guests 18 and older at all times of the day. 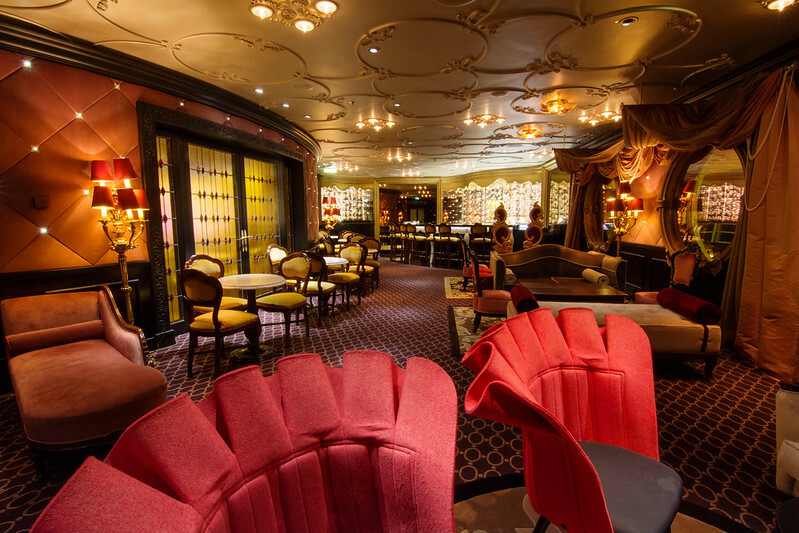 We really enjoyed Ooh La La as a quiet getaway for great pre-dinner cocktails. I also love the decor in Ooh La La. The ceilings are beautiful. 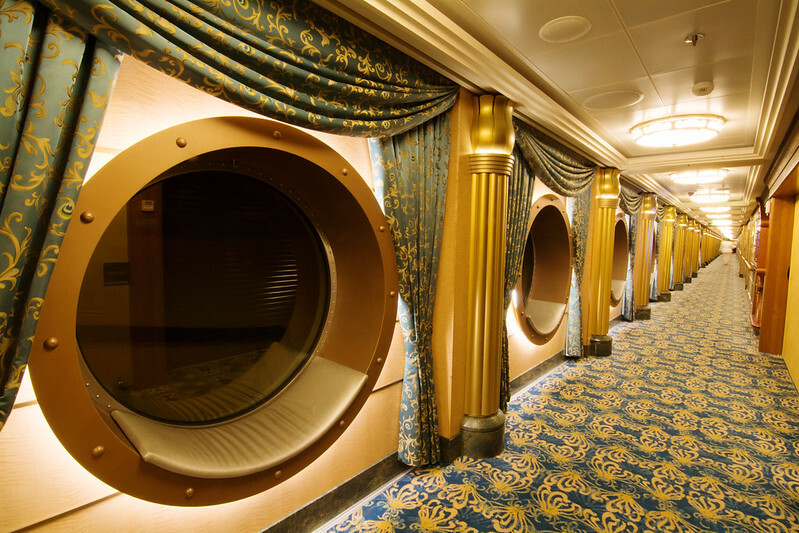 We really didn't hang out in O'Gills this cruise. Max and Dad went there once to get a draft beer that had been recommended to them, but they were really annoyed because the bartender wouldn't let them sample the beer before they purchased it (this was the only time that occurred on the cruise). Sure enough, they were both stuck with 22 ounces of a beer they didn't like. 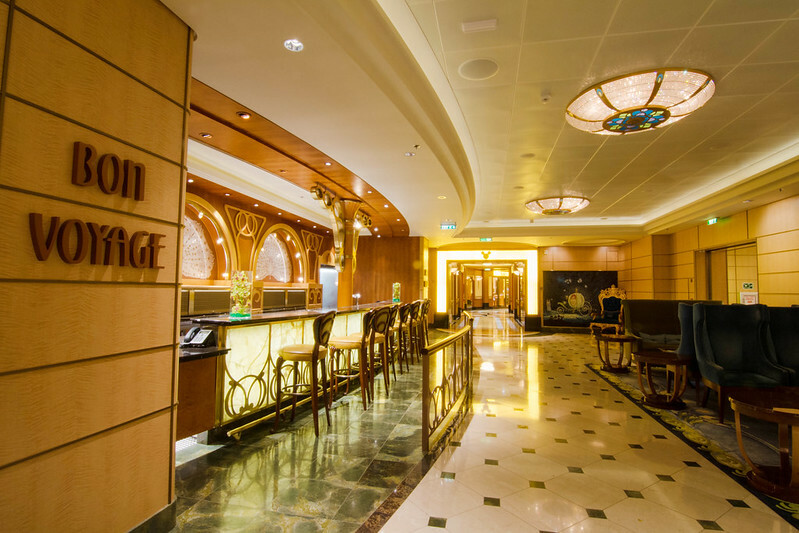 The Skyline Lounge is where our mixology class was held on the first sea day. 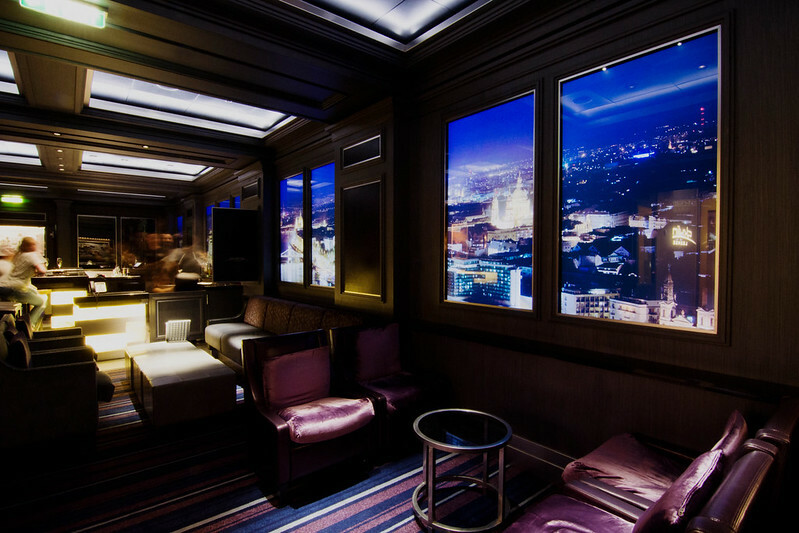 The concept of this lounge is that the skyline changes, so you always have a different view. 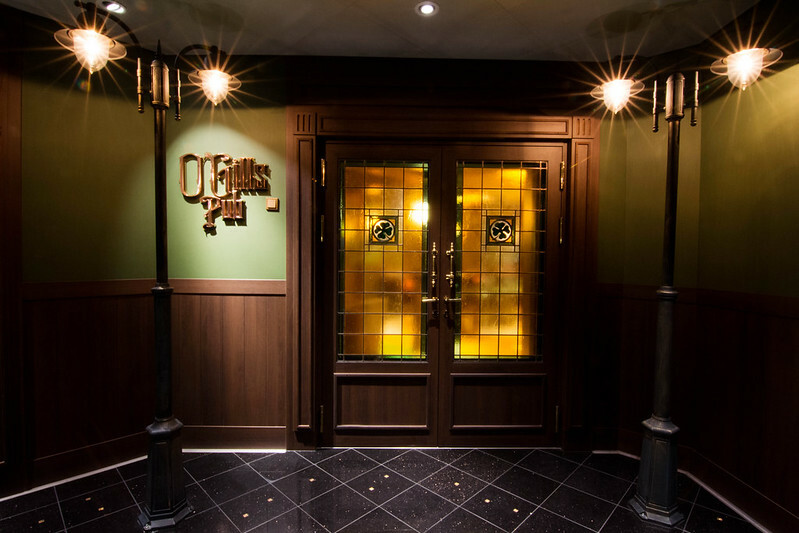 The menu features drinks created for each of the skylines that appear - Paris, London, Barcelona, Athens, Florence, Budapest, and St. Petersburg. 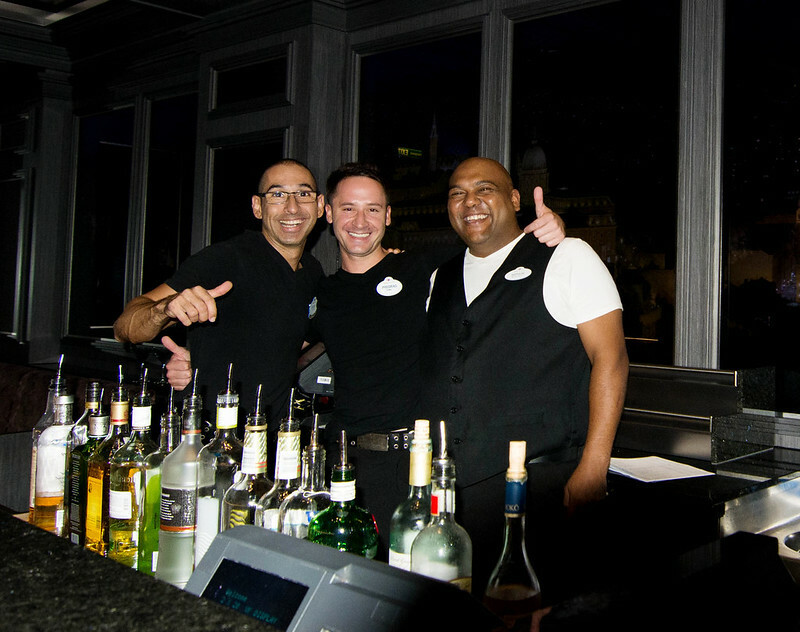 The bartenders saw me photographing the lounge and called me over to take their photo! The one on the right is Arthur who taught our mixology class. 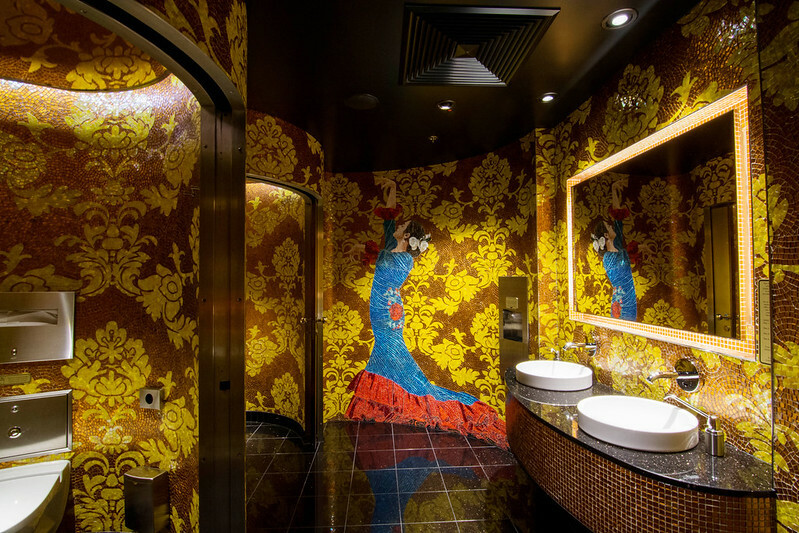 If you are offended by photos of bathrooms, I'd like to strongly recommend that you briefly push that aversion to toilet pictures aside so that you may enjoy the next photograph. 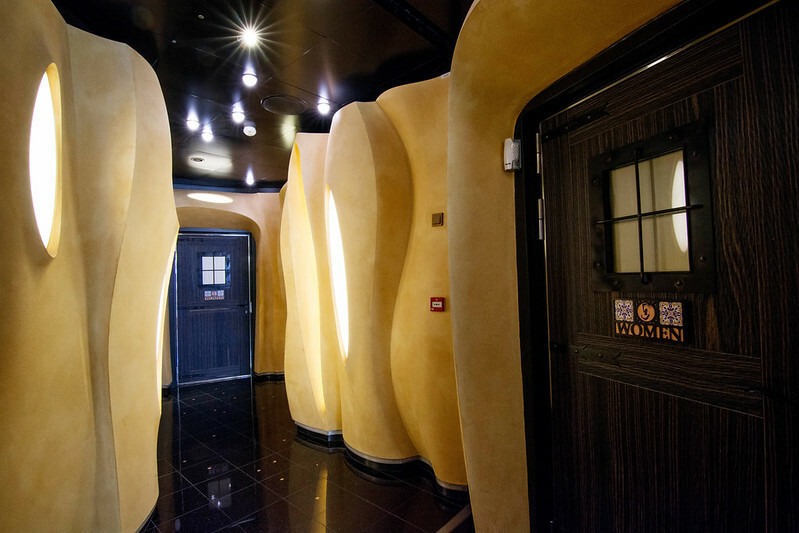 The "Cave of Bathrooms" located inside Europa contains the most beautiful bathrooms I have ever seen. 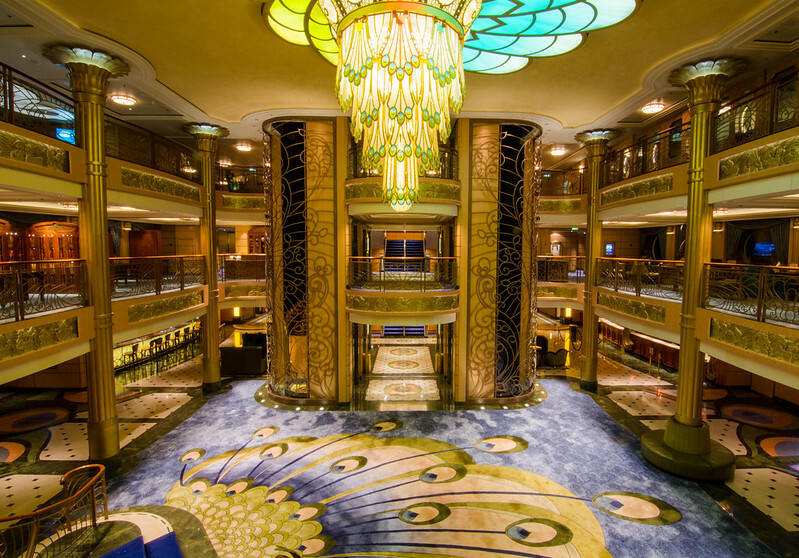 The walls are completely mosaic. 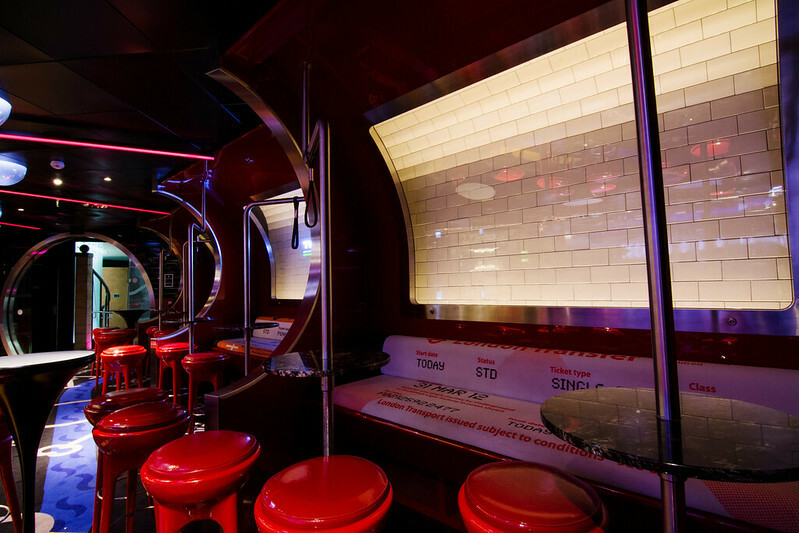 The stalls are actually mosaic-covered pods that you shut yourself in by pulling a round pocket door. 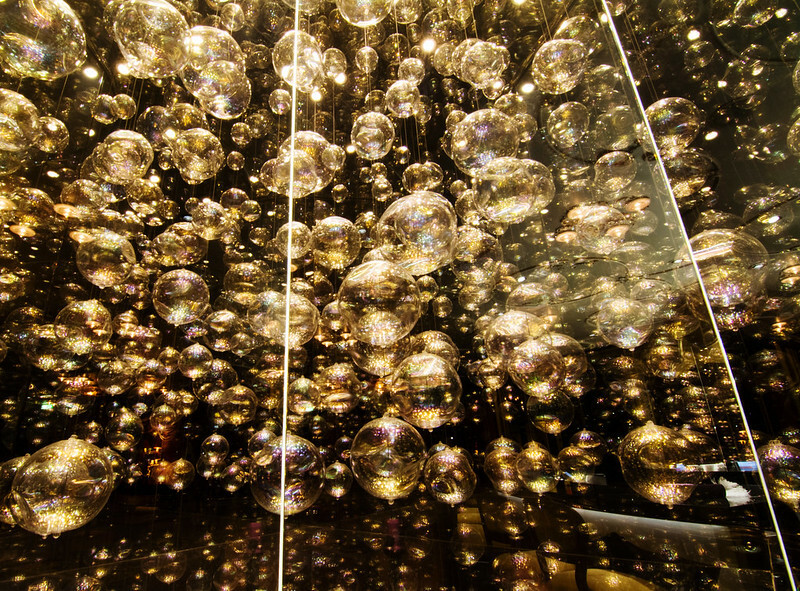 Also, these bathrooms are always sparkling clean. I think as soon as the cast member finishes cleaning all of the bathrooms, she immediately starts back again. 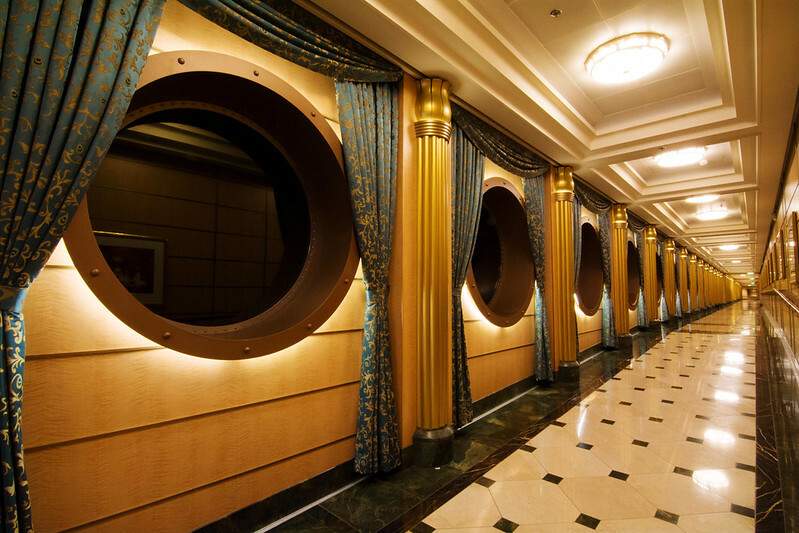 Disney Cruise Line easily has the cleanest and most beautiful public bathrooms at sea. 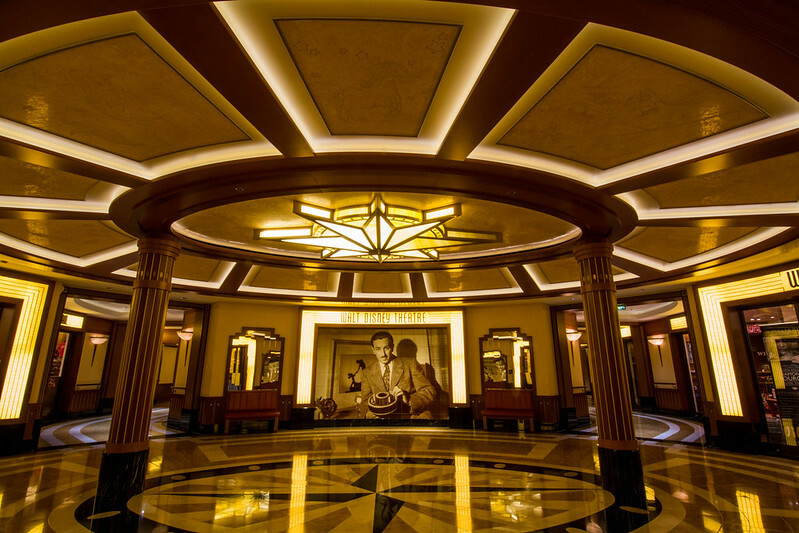 Disney closes their three rotational dining rooms when they are not in use, so I was unable to take a long exposure photo of the interior. 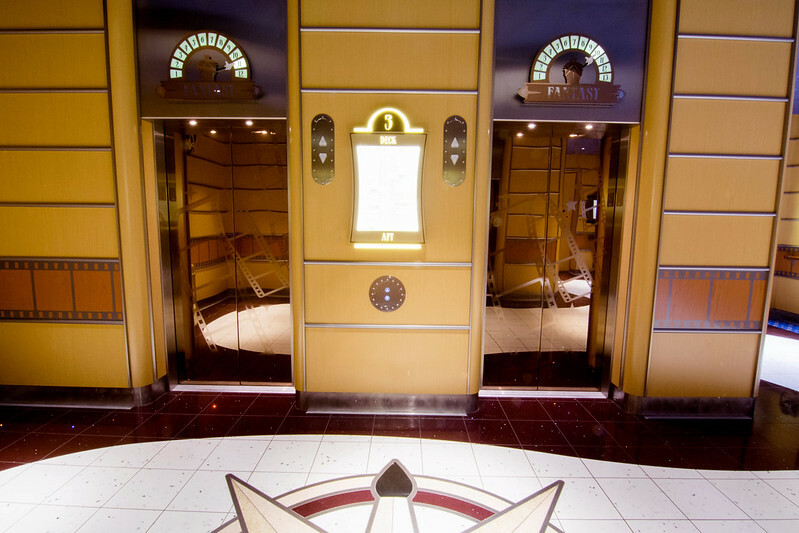 However, I did take photograph the entrances to each. The door to Animator's Palate had been left open, so I crept in. They do, however, cover their table settings with yellow cloth, I suppose so that they do not become infected overnight and they do not have to redo them in the morning. 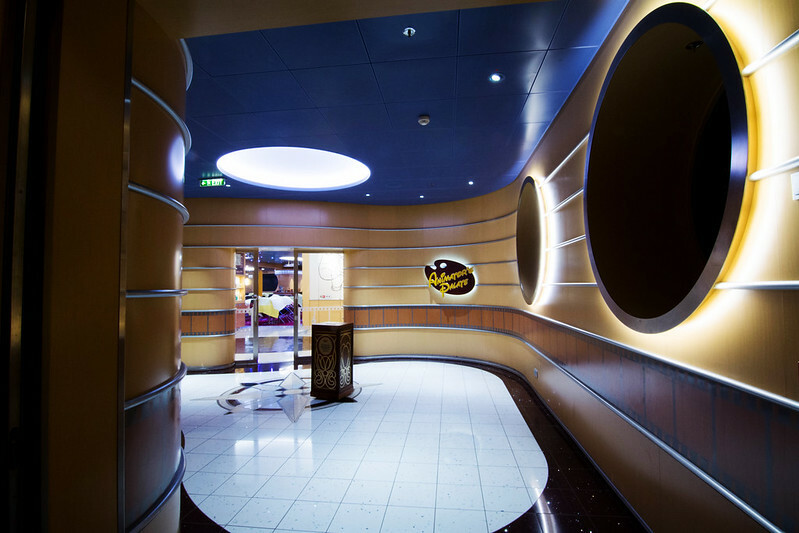 The long hallway above connects the aft of the ship on the third deck (Animator's Palate) to the atrium. We called it the 'Puke Hallway' because twice we walked by and there was vomit there that we almost stepped on. I suppose because the hallway is so long, people (well, I hope children) who feel an incredible urge of seasickness while dining in Royal Court are unable to run to the bathroom or a trashcan in time, so they just spew their digested food all over the marble tile which makes for a slippery, disgusting mess in a high-traffic area. Disney does clean it up quickly. 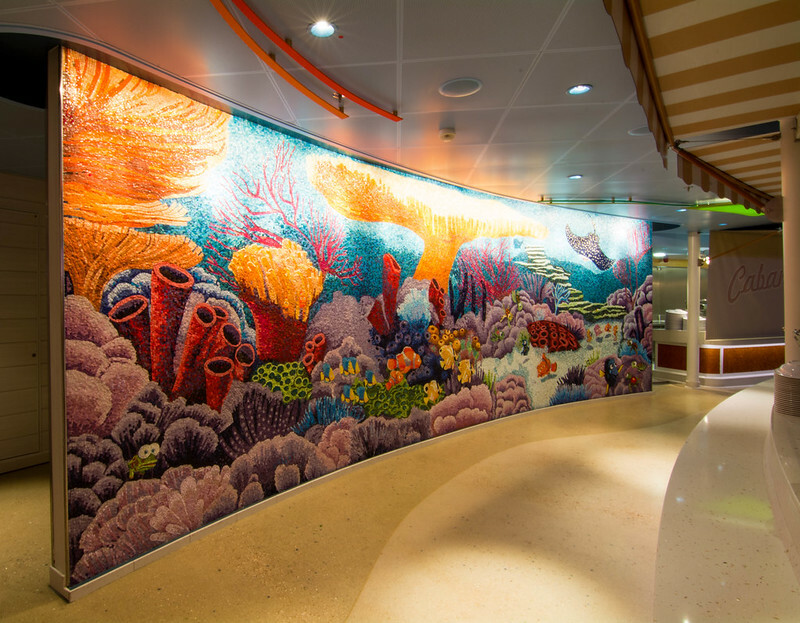 This is the hallway on the fifth deck which leads to the Oceaneer Club and Oceaneer Lab. 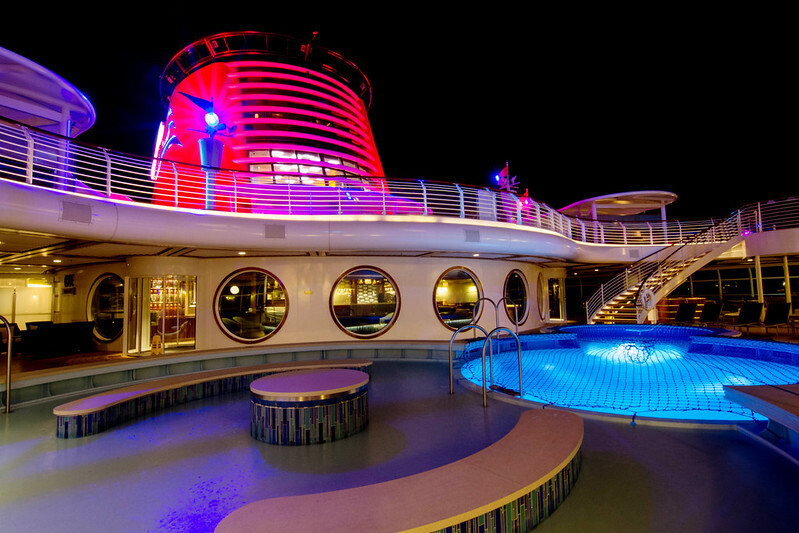 Notice that the ceilings are lowered. 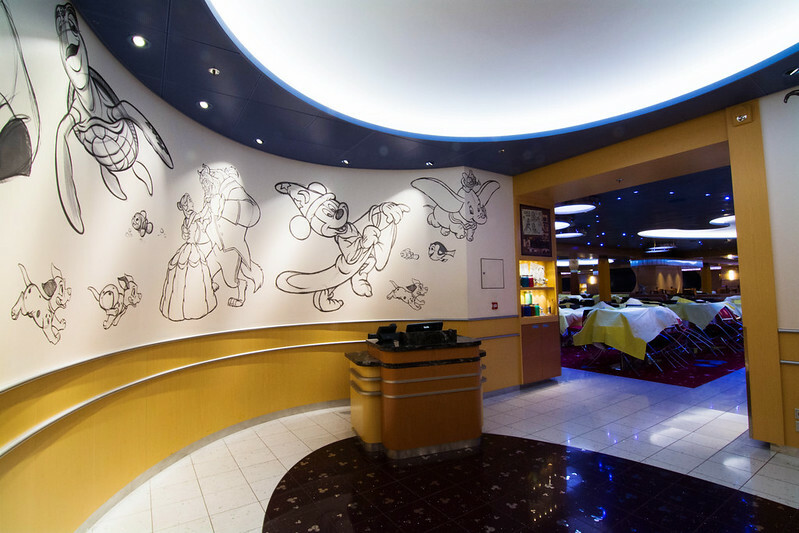 Disney Imagineers designed it so that the children's areas had low ceilings so they don't feel so small in spaces designed specifically for them. And speaking about designing small, Pepe's cabin door is sized just for him! Beautiful photos and great compositions. Thank-you for sharing your adventure. Gorgeous shots. Really great post. If I can give a tiny bit of constructive feedback -- your apertures are too small. When using ultra wide angle, you can get an infinite depth of field at f8 or so. Which also happens to be around the sweet spot of most lenses, and will allow for lower ISO. F8 will being much higher resolution than 22-- a sharper shot. And lower ISO will bring you not just less noise, but also more detail and more dynamic range. Thanks for the feedback; that's definitely something to consider! Sometimes I get a little lazy (eh, I call it "busy") and stick with rules I've learned, like smaller aperture, infinite depth of field. Editing the photos, I did notice a decrease in sharpness and was wondering what I was doing wrong. I'll give wider apertures f/8 and f/11 a try with the 11-16mm lens. I figured that's what led you to do it. Beyond around f11, lenses soften due to diffraction. You'll get much more pop in your shots sticking to ideal apertures and low ISO. google a depth of field calculator and play around with it, so you get a general idea of what apertures you need at different focal lengths. Thank you! I will definitely check out the depth of field calculator. 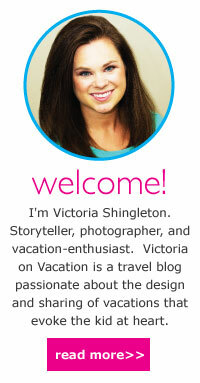 Beautiful photos Victoria! Thank you for the Understanding Exposure recommendation....I just ordered it. I have taken several photography classes and still have trouble with shutter speed, aperture and ISO!! Thank you! I found Understanding Exposure very helpful - so much that I've read it three times now and go back to it for reference.